When the lighting is just right. Almost all of our images are taken in the Martian afternoon, around 3 p.m., and sometimes the lighting conditions make a particularly striking image. 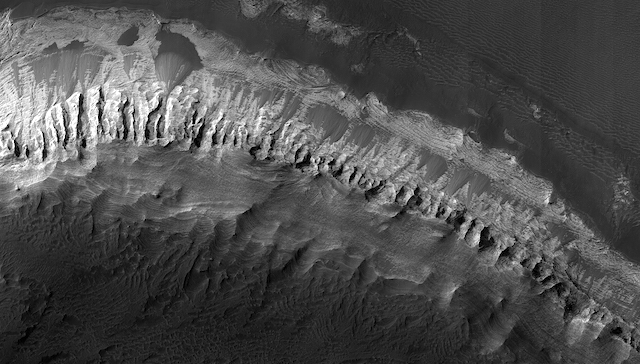 These are layered sediments in east Melas Chasma. This entry was posted in Reports and tagged High Resolution Imaging Science Experiment, HiPOD, HiRISE, HiRISE Picture of the Day, layered deposits, layers, Mars Reconnaissance Orbiter, Melas Chasma, MRO, NASA, sedimentary deposits, University of Arizona. Bookmark the permalink.